Emergency crews are working to get some White County roads reopened after severe flooding earlier this week, according to the National Weather Service. Storms dropped more than 14 inches in the last week and more is on the way Friday through the weekend. Forecasters warn of a "hazardous weather outlook," with the possibility of damaging winds and hail in the afternoon. Floods in North Georgia have emergency crews out today working to get some White County roads reopened. Storms dropped over 14 inches in the last week and the National Weather Service forecasts more on the way. A flash flood emergency was in effect Thursday night for parts of White County in North Georgia, where severe flooding overwhelmed the city of Helen after about 6 inches of rain fell in a few hours. 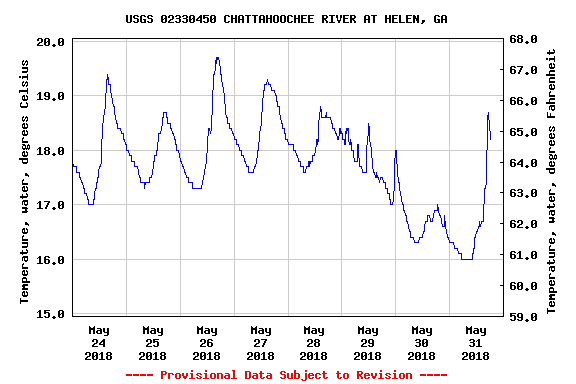 Officials said water levels in the Chattahoochee River have started to go down and storms that previously stalled over the area will move on. While the lower river water levels should alleviate most of the concern, more flooding is possible. Residents need to stay away from surging rivers and creeks, White County emergency services manager Dave Murphy said. Water's normally a big tourist draw for the city of Helen, but right now those waterways are swelling fast. This means currents are swift, dangerous and filled with debris. Despite the warnings, they've seen people tubing and kayaking on the Chattahoochee. On Thursday, a woman was rescued after her car got caught on a flooded White County road. Spokeswoman Cami Downey said people should stay off flooded and closed roads. The U.S. Geological Survey is streaming footage of the river flooding in Helen. Crews were out assessing roads and damage to property. "Stay out of the rivers, stay home and keep an eye on the news," Downey said. Two teenagers were rescued Tuesday night after getting stranded near a waterfall at High Falls State Park, despite signs indicating dangerous conditions on the Towaliga River, Monroe County officials said. 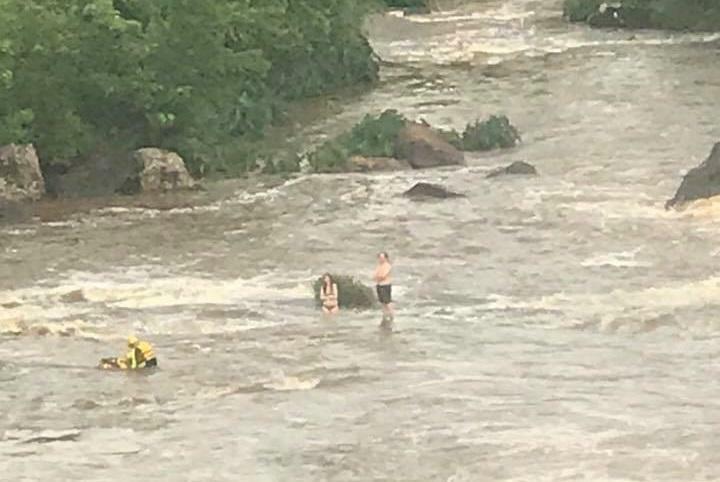 The Monroe County Emergency Management Agency posted on Facebook that a swift water rescue was in progress around 5 p.m. Tuesday. 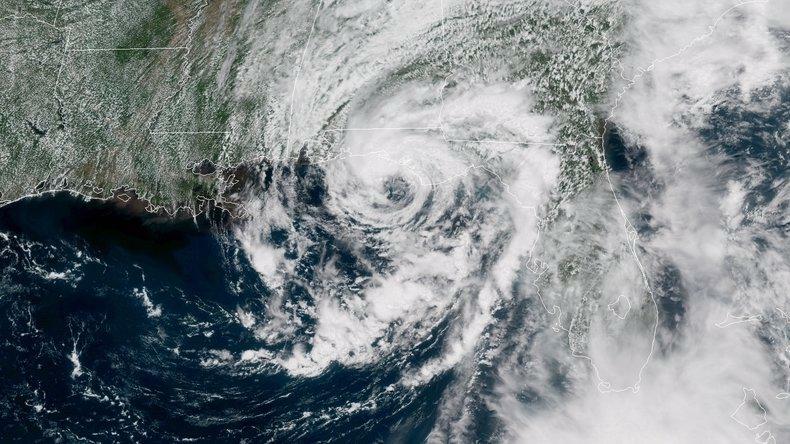 Two journalists on duty were killed Monday as Subtropical Storm Alberto made its way north after making landfall in Florida’s panhandle. Photojournalist Aaron Smeltzer and Anchor Mike McCormick of WYFF News 4 in South Carolina were killed when a tree fell on their SUV in North Carolina. The accident happened on Highway 176 in Polk County while they were covering the impact of heavy rain in that area, according to WYFF News 4.